NOTE: This package is an AD2000 Dialer with Power Loss and Power Restore Modules added to it. That will take up two channels on this dialer, allowing two channels for use. The AVD-2010 is the "smartest", most comprehensive automatic voice security dialer available. 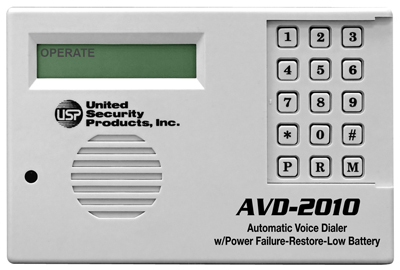 Representing an exciting new level of achievement, the AVD-2010 combines technologically advanced features, ease of programming and reliable operation in a compact, unobtrusive dialer completely compatible with any security alarm system. The AVD-2010 features a Power Monitoring System (PMS) that constantly operates in the background. In the event of a blackout, or when battery voltage falls below a safe level, or when power is restored, the PMS automatically dials out and notifies by means of pre-recorded voice messages which of the three conditions have been detected: "AC POWER OFF", "BATTERY LOW", or "AC POWER RESTORED".